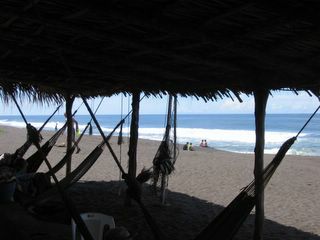 Chilling under the hammocks to beat the heat at Monterrico. While the USA was celebrating 4th of July weekend, our friends Mark and Jennifer arrived from Arizona to travel in Guatemala for a month, so we took the opportunity to hit the beach for a few days. 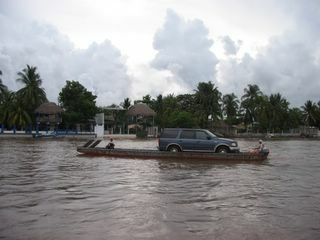 And Monterrico does not let you forget that it is still a small rural village. As we walked down the main road on Sunday morning, what do you think we happened to see? How about half a dozen men butchering a cow in a driveway…at 6am, no less. A beautiful site on a Sunday morning, to be sure, with cow legs sticking out of a large bucket and guts piled up off to the side. Is this a normal occurrence here in Monterrico? Apparently if there’s an intra-regional soccer game in town that day. To top it all off, we woke on Monday morning to learn that one of the hotels in the center of town had caught fire around 2am. Was this the handiwork of inebriated villagers? 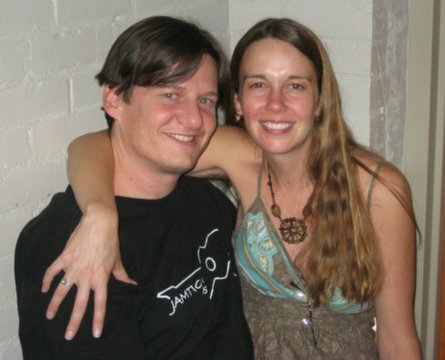 We can only guess that there might be a connection here. Fortunately, the damage was mostly limited to the roof, since the standard Guatemalan building material is cinder block, which holds up nicely in fire. Still, the thatched palm roof was completely gone, and we’re guessing that it produced some big, hot flames. 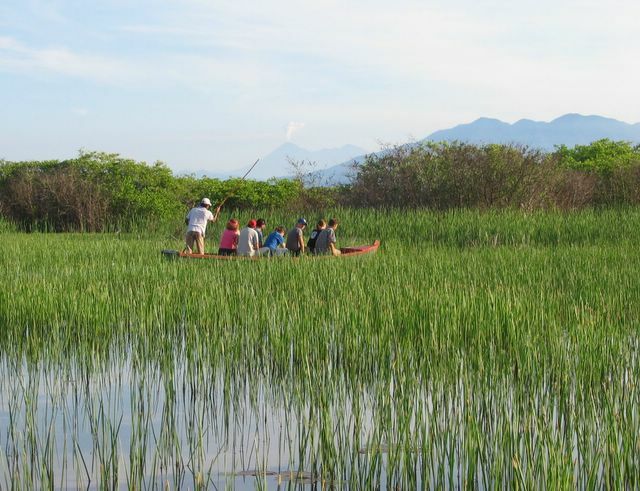 All in all, despite a rather common misconception, Guatemala is really not known for its beaches. This is definitely not Mexico or Panama, with their miles of beautiful white sand, perfect waves and trendy resorts. Monterrico’s sand is black, for one thing, due to the nearby presence of lots of volcanoes. The waves are enjoyable, although the water is so warm as to be not really refreshing in the ominous heat of the sun. The town does have about a dozen small hotels (usually sans air-conditioning, however a fan and mosquito net are provided; the lack of hot water is not a problem in the sweltering heat), several clubs and bars (mostly playing loud electronic house-party music, unlike the reggae and meringue that’s more common on the Caribbean coast), and a handful of restaurants (mostly of dubious quality, except for the excellent El Pelicano with it’s creative dishes and excellent vegetarian fare). Monterrico is completely separated from the mainland of Guatemala, so the only way to get there is by boat, either across a channel or through a mangrove swamp. 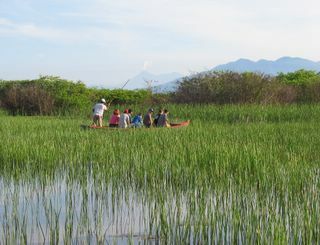 One of the highlights of Monterrico was the early morning boat ride we took through the swamp that separates the town from the mainland. 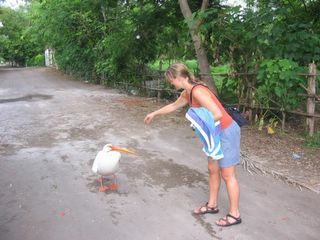 The swamp is supposedly inhabited by plenty of turtles and even caymans (small alligators), but all we saw were birds. 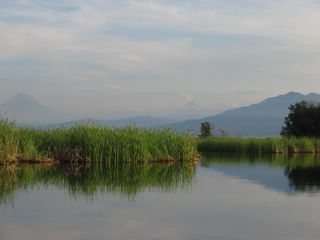 From the swamp, we had a nice view of the distant volcanoes of Agua (left) and Pacaya (with smoke). See our Pacaya post for photos of the top of this volcano! 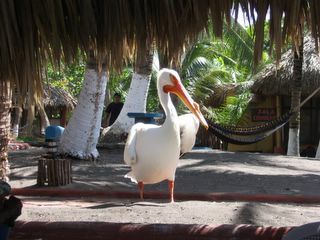 This pelican was the toughest character in town! 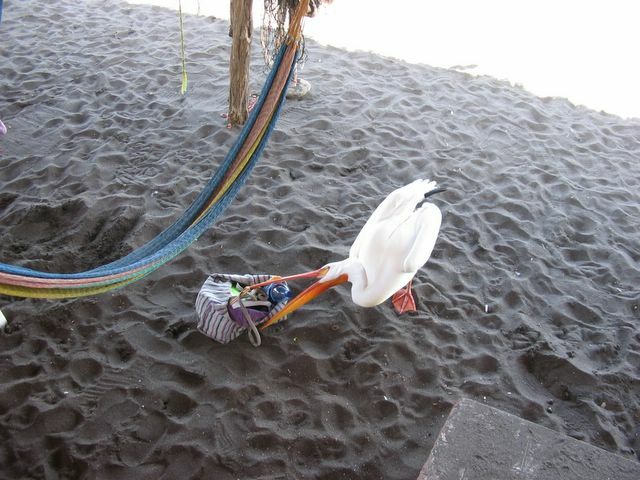 After chasing Carley out of her hammock, the pelican tries to see what goodies are in her bag. Jennifer tempts fate with the feisty pelican.